Berkeley DB (libdb) is a programmatic toolkit that provides embedded database support for both traditional and client/server applications. 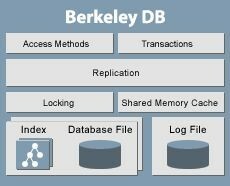 Berkeley DB includes b+tree, queue, extended linear hashing, fixed, and variable-length record access methods, transactions, locking, logging, shared memory caching, database recovery, and replication for highly available systems. DB supports C, C++, Java, PHP, and Perl APIs. It is available for a wide variety of UNIX platforms as well as Windows XP, Windows NT, and Windows '95 (MSVC 6 and 7). Sleepycat Software makes Berkeley DB, the most widely used open source developer database in the world with over 200 million deployments. Customers such as Amazon.com, AOL, British Telecom, Cisco Systems, EMC, Google, Hitachi, HP, Motorola, RSA Security, Sun Microsystems, TIBCO and VERITAS also rely on Berkeley DB for fast, scalable, reliable and cost-effective data management for their mission-critical applications. Profitable since it was founded in 1996, Sleepycat is a privately held company with offices in California, Massachusetts and the United Kingdom. Less complexity and more reliability. Berkeley DB is distributed under an open source license that permits its use in open source applications at no charge. Proprietary vendors can purchase a proprietary license for Berkeley DB from Sleepycat Software. Small footprint � less than 500 kilobytes. Extremely configurable: application controls the memory, disk, and other resource requirements of the database library. Easy-to-use APIs for applications written in C, C++, Java, Perl, Python, Tcl, PHP. Supports full transaction semantics, so that multiple changes can be applied or rolled back atomically. Survives software and hardware failures without losing data. Fine-grained locking allows thousands of users to work with a database at the same time. Replication for high availability keeps copies of the database synchronized across multiple servers. If the master or any replica goes down, one of the remaining replicas can take over.